Stocks Recover; But is it Sustainable? On Christmas Eve it felt like stock markets were losing all support as the massive sell-off had made it the worst December since 1937, during the Great Depression! But, as typically happens when there seems no hope and no good reason to own stocks, the market rallied. The recovery at that time was effectively a combination of many factors including a totally oversold technical condition, the end of the tax-loss selling season, massive year-end pension re-balancing in the largest U.S. funds and some very ‘dovish’ commentary from the Federal Reserve about a more nuanced approach to interest rate increases in 2019. Stocks rallied slightly into year-end and then charged into January with a rally very reminiscent of the January rally 12 months ago. The most beaten-up industrial and financial stocks led the advance, helped later in the month by earnings which were not quite as bad as feared. In Canada, the resource stocks remained ‘non-entities’ in the recovery but the financial stocks rose as did the health care group, lead entirely by the Cannabis stocks, which had dropped sharply in the fourth quarter following their legalization on October 18th. The big question now is whether that was just an oversold bounce off the bottom and are we due for a retest of the lows or was that 20% ‘high to low’ enough and the worst part of this downturn? We once again gravitate to the more sombre view that the economic news will continue to deteriorate in 2019 and earnings will come in below expectations, leading to another move to the downside. The stock market has clearly had a more impressive bounce than we expected and we have to be impressed with its ability to take bad news in stride, which is often the sign of a market bottom. Witness the rather sombre outlook from semi-tech bellwethers Intel and Texas Instruments. While both pointed to a weak industry outlook and 2019 earnings below those of 2018, both stocks and the entire semi-conductor group rallied sharply. This tells us that a lot of bad news has already been ‘baked into’ the outlook for many stocks. However, we wonder if a continued flurry of bad economic and earnings news will be more than this stock recovery can handle. This week started out with an earnings miss and very weak outlook from Caterpillar Inc., a key indicator for both capital spending and Chinese growth. A weak outlook from one of ‘formerly hottest’ chip stocks, Nvidia, was also not taken so well. With economic growth slowing in Europe and Asia and the problems in the U.S. from the government shutdown and tariff impacts, we seriously question the ability of stocks to make anything other than a ‘bounce’ off dramatically oversold levels. Looking at more depth at this January recovery, it looks like the bulk of the buying has been from retail investors as well as ‘short covering’ by hedge funds. ‘Up market’ days have occurred on low volume, another sign that buying is somewhat ‘thin’ and unsustainable. The major pension re-balancing cited at year-end has been largely completed, so we don’t expect any further buying from that source. In the arena of stock buybacks, most companies are in their earnings ‘quiet period’ so share re-purchases are on hold. While investors have been doing some buying in January, this not the case in the prior month, which saw them dumping stocks and corporate bonds at the fastest pace ever. Mutual funds invested in equity and bonds lost a record $152 billion in December, while U.S. equity exchange-traded funds just had their first back-to-back weekly outflows since July 2018, shedding $7.1 billion in the last two weeks of December, according to TrimTabs Investment Research. Demand for U.S. stock index ETFs has also been diminishing and the liquidity outlook for U.S. equities remains downbeat. More surprisingly, last year’s poor performance also came at a time when Corporate America was committed to buying back $1.34 trillion of its stocks, just shy of the annual record of $1.46 trillion in 2015. In December alone, US firms announced $91.8 billion corporate buying, a six-month high. Despite the sheer size of the buybacks, they did little to keep the markets afloat as the Dow bled 8.6% in December! 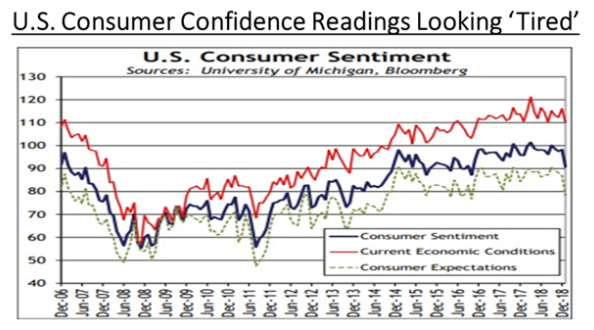 Shaky stock market results in 2018 have also started to undermine consumer confidence in the U.S., the former stalwart of the recovery over the last two years. Another danger for the stock market is that earnings expectations are falling, too. In December, analysts cut their earnings forecasts for 2019 on more than half the companies in the S&P500, according to FactSet. For now, analysts still expect profits to keep growing in the coming year, but at a slower pace. They expect earnings for S&P500 companies to grow 7.8% in 2019, down from their forecast of 10.1% at the end of September. That is a big reduction from the estimated 22% earnings growth rate in 2018, when corporate results were boosted by tax changes and a strong economy. Meanwhile, November’s U.S. wage growth matched the highest rate in nearly a decade, which will be a pressure point for corporate profit margins just as they grapple with tariffs and supply-chain disruptions sparked by U.S. and China trade tensions. The wage growth acceleration will also give the more ‘hawkish’ governors at the U.S. Federal Reserve more reason to keep some upward pressure on interest rates. To close the loop on risks for the profit outlook is the typical trend of stock analysts tend to start the year too optimistically, especially after a few years of strong economic growth. Annual earnings growth estimates for the S&P500 have been on average 5.5 percentage points lower at the end of the year than initially estimated in January.